There’s nothing like the aroma of fresh-baked cookies. Mmmm! Participating in culinary activities is one of the many choices in the Community. 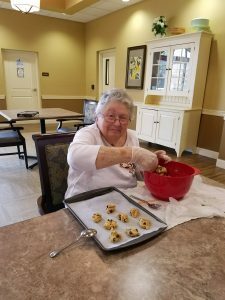 The cookie baker shown here is Ms. Sue and she’s one of our wonderful residents. Originally from Freeport, Illinois, Sue is a retired teacher who holds a doctorate in education. You can find Sue painting, drawing, exercising, or participating in many of the activities available to our residents. In fact, Sue loves to dance and is typically the first one up and moving when there’s entertainment in the Community. Sue’s family is very important to her. They spend time together often and enjoy visiting Walt Disney World together several times a year. Sue always has a smile for everyone she meets and we love having her as part of our Tuscan family. Say hello to Sue when you see her. She’ll be happy to know you. Click to read Tuscan Gardens® of Venetia Bay’s community newsletter for January 2018.